Conducting an outreach campaign to boost brand awareness used to be an expensive endeavor. These days, however, several low-cost platforms have dismantled the traditional barriers to entry to conducting influencer outreach and, instead of traditional media, more and more people’s purchase decisions are influenced by so called influencers, who use social media and blogging extensively. The trust level that these influencers hold over their network has a high rate of driving their audiences to take positive action, and this is the sort of engagement you should capitalize on if you want to drive more brand awareness for your business in the most cost-efficient way. The power of blogging and influencer endorsements to influence consumer decisions is increasing. According to online media source for marketing MediaPost.com, about 60% of of consumers consult social media and blog posts before making a purchase. Meanwhile, a survey by marketing firm Collective Bias found that nearly 60% of consumers take a blog review or social media post into consideration before making a purchase. The same study also found that 70% of millennials surveyed said they would trust an influencer endorsement (that is, an influencer they view as a peer) more than a celebrity endorsement. Thus, for our December expert roundup post, we wanted to compile outreach best practices with tips gathered from influencers themselves— after all, influencers would have received more than their share of outreach from other businesses and bloggers, and would have a story or two to tell about how best to get these things done. With this goal, we sent out queries to some select influencers in our list and got back 15 responses. For this expert roundup edition, however, we’d like to deviate from our usual format. Instead of compiling and republishing answers as they are, we will be organizing our influencers and their quotes according to the best practice concepts we have distilled from all their responses. Hopefully, this should give you a more coherent and story-fied reading experience. 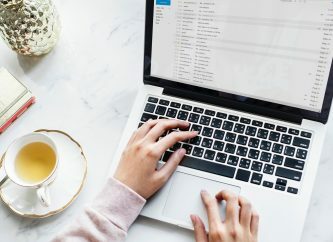 So, if you are frustrated at not getting any responses from your outreach emails, or if you want to increase the number of influencers who respond to your emails, then this post is right for you. 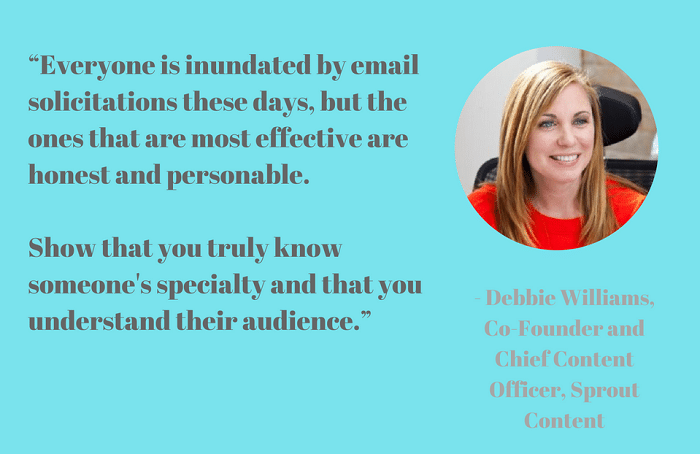 “Be authentic and do your research.” These are the opening words of our first influencer tip from Sprout Content Co-Founder, Debbie Williams. Williams, who is also Chief Content Officer for Sprout Content, is obviously no stranger to influencer outreach. Once you’ve done your research and prepped your pitch, another best practice, of course, is to make sure your outreach email immediately presents some sort of value to your target influencer. 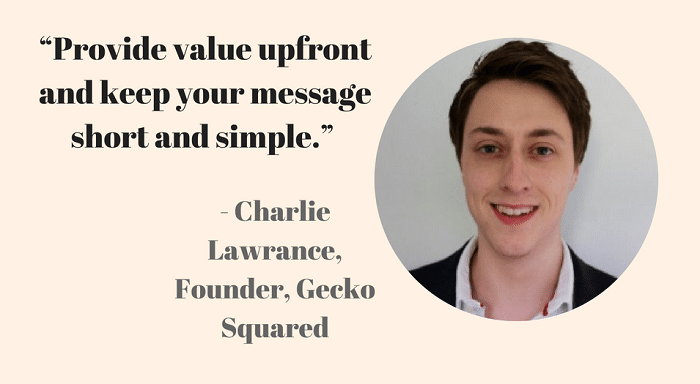 According to the founder of digital marketing agency Gecko Squared, Charlie Lawrance, catching an influencer’s attention requires providing value from the get-go. Lawrance adds how he and his team normally connects with decision makers such as, say, the marketing director or CEO of a target company on LinkedIn. They then offer some suggestions as to how these decisionmakers could potentially improve their campaign. “It’s a great foot-in-the-door technique,” Lawrance says. 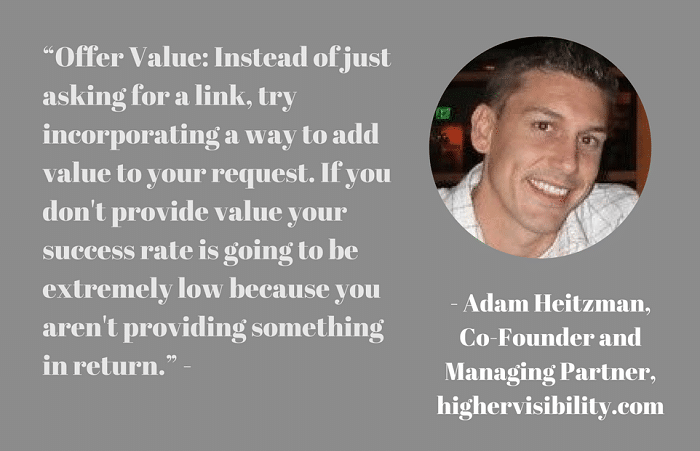 Adam Heitzman, meanwhile, who is Co-Founder and Managing Partner for internet marketing company highervisibility.com, insists on the same best practices. So the message is pretty clear. Always find a way to add value. Your success rate depends on it. 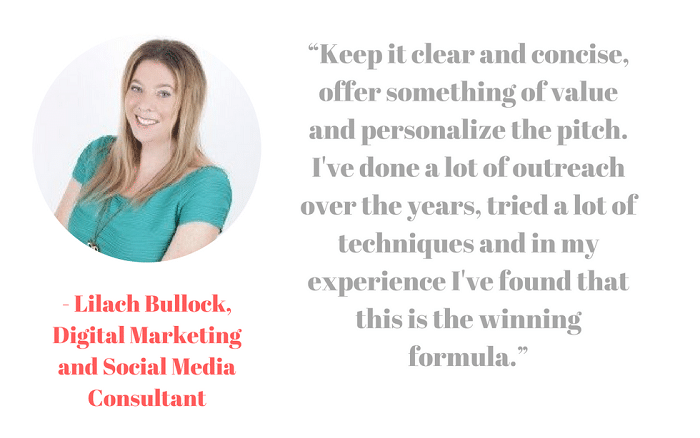 For digital marketing and social media consultant Lilach Bullock, she swears by three rules that she always follows when it comes to outreach. First, keep your pitch clear and concise. Offer something of value and personalise the pitch. Second, personalize your outreach email. Show your familiarity with the influencer and the influencer’s content, but avoid long-winded emails. And third, as other influencers have iterated, is to offer something of value, whatever you are looking to get from your outreach. Five of our influencers all agree that nothing turns an influencer off than the sense that you don’t really know them and don’t genuinely relate to or know what it is they do. According to content marketer Salma Jafri, who has worked as marketing consultant for Deloitte & Touche and as marketing manager and technical writer for software and elearning firms, you should find something in common with the influencer. Identify some common ground, and spark up a conversation from there. From this tête-à-tête, see how you can delight, and execute your plan. 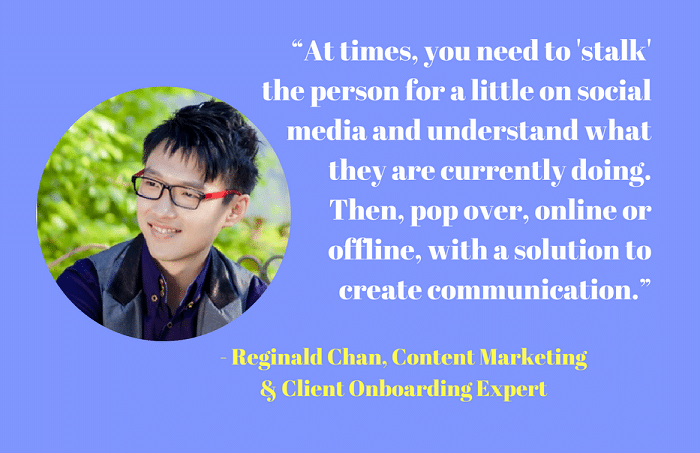 Reginald Chan of digital marketing solutions agency Marketing Lancers, offers a more aggressive way of connecting with your target influencer: that is, investigating your target for a while on social media. According to Chan, this is so you can identify and understand the target, then strategize accordingly how to open up the communication lines. 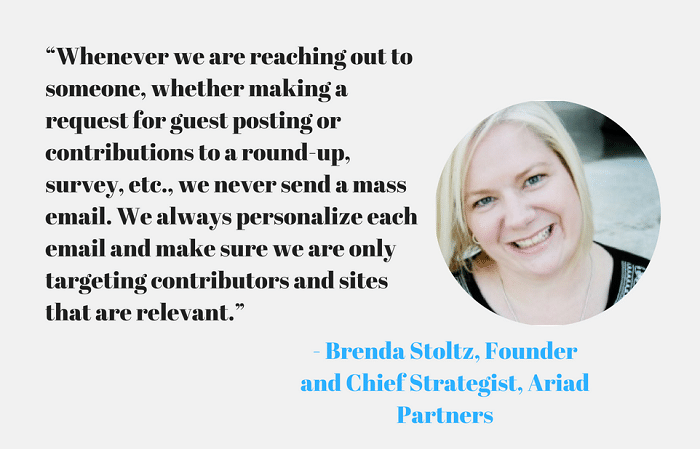 Meanwhile, Brenda Stoltz, Founder and Chief Strategist of inbound marketing company Ariad Partners, warns against the temptation to resort to mass email. “Keep it personal and relevant,” she says. 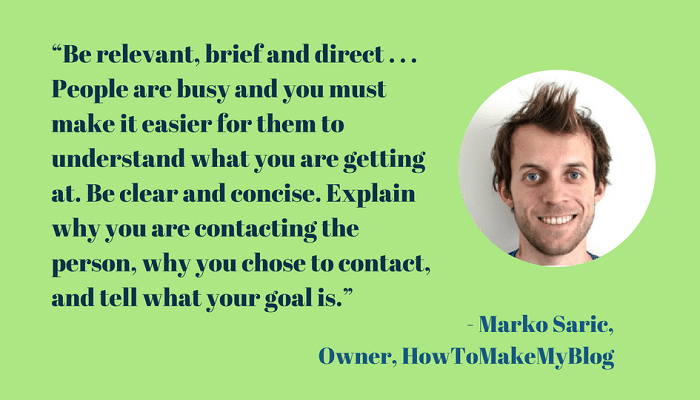 The comments of Marko Saric, owner of HowToMakeMyBlog, highlights certain situations he’s encountered which proves how sending mass emails indiscriminately can really backfire on you. “You cannot imagine how many emails I get that have nothing to do with what I am working with,” Saric recounts. 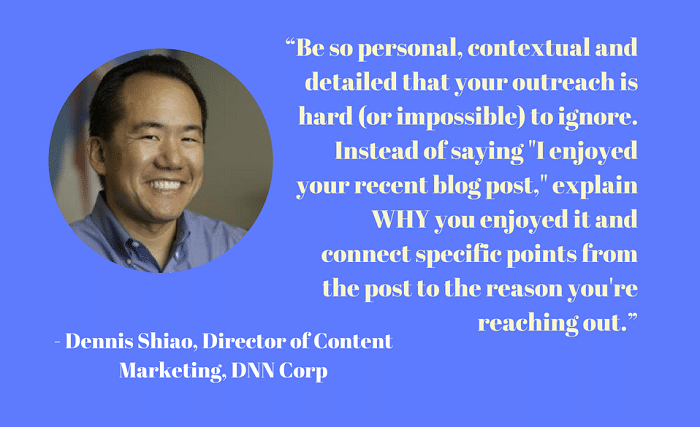 As Director of Content Marketing for content management systems company, DNN Corp., Dennis Shiao rounds up the tips in this section with his own cautionary advice against generic outreach messages. “Instead of saying ‘I enjoyed your recent blog post,’ explain why you enjoyed it and connect specific points from the post to the reason you're reaching out,” he suggests. 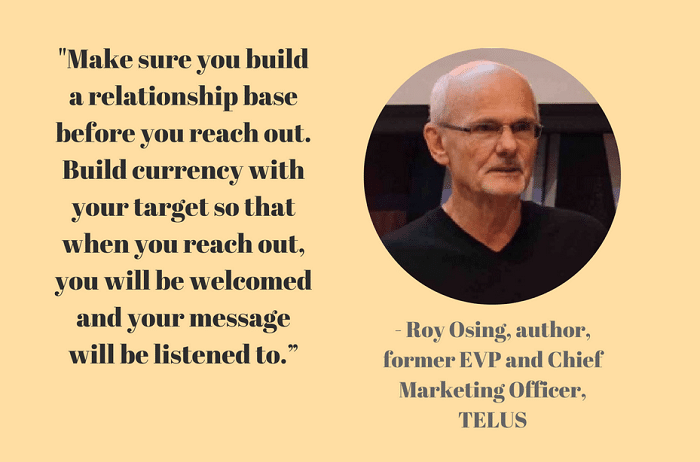 As the author of the Be Different or Be Dead book series, Roy Osing shares the lessons he’s learned from his extensive experience in business and the marketing industry. He was former President, Executive Vice-President, and Chief Marketing Officer for Telus Corporation. 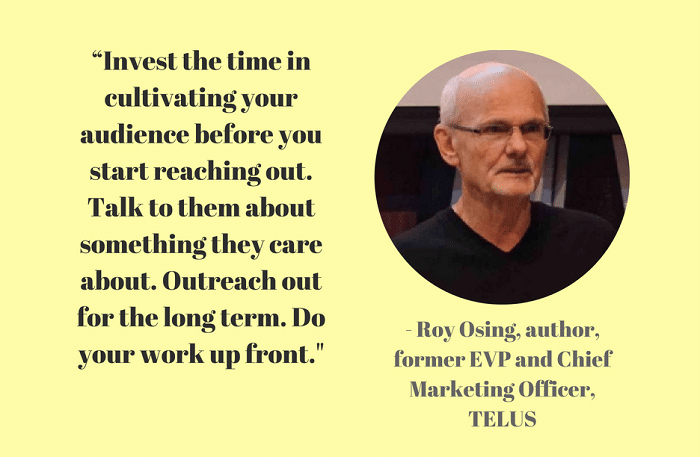 Osing’s piece of advice for those doing outreach to influencers: connect with warm, and not cold leads. "Make sure you build a relationship base before you reach out. Build currency with your target so that when you reach out, you will be welcomed and your message will be listened to,” he advises. Osing urges against cold outreach and says a cold approach is not a good investment. Says Osing: “It's one-sided in pushing your interests and often represents noise to the recipient; an intrusion in their space and time. 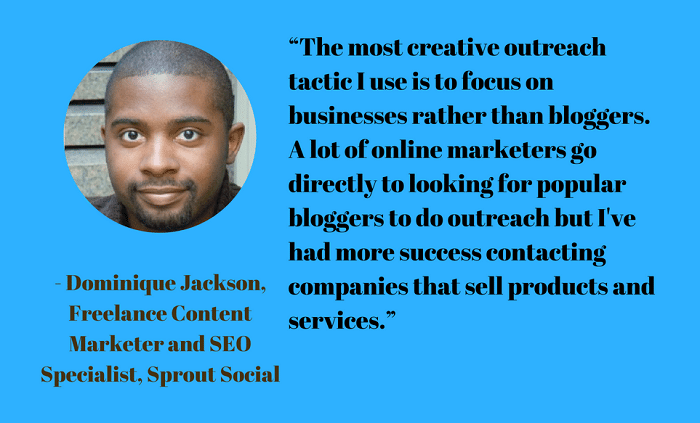 Dominique Jackson, a freelance content marketer and SEO specialist for Sprout Social gave us his own unique take when it comes to outreach. According to Jackson, the most creative outreach tactic he uses is to focus on businesses rather than bloggers. 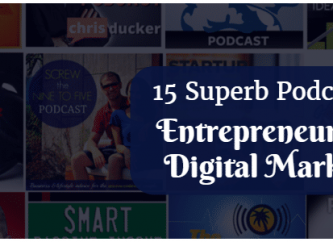 Jackson also notes that, compared to most bloggers who rarely have a dearth in content, businesses tend to have a problem with producing their own content consistently, and this is where you can come in to offer value. Jackson lays out his entire process for doing outreach directed towards businesses, which we shall feature in its own standalone post. 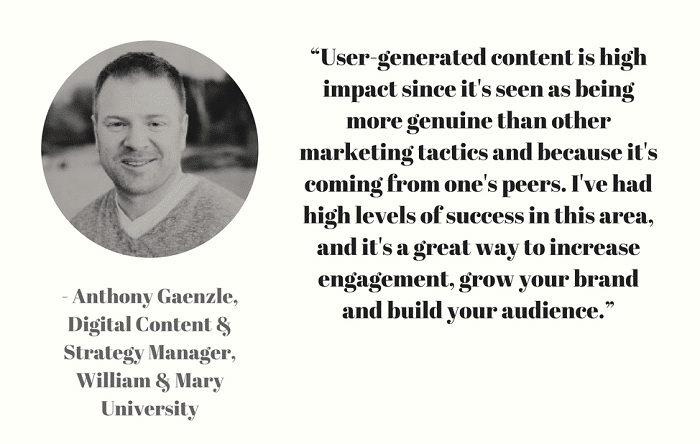 “User-generated content is highly effective, both in engagement and in cost.” So says Anthony Gaenzle, who has held various management roles in marketing and who currently manages digital and content strategy for William & Mary University. Gaenzle further explains how Instagram takeovers are a great example for this, and describes how to build relationships and create brand evangelists by allowing a user of your product or service (in his case, college students) to post pictures showcasing their relationship with your company on your official Instagram channel. As someone who has served senior management roles in media and brand management for companies like Procter & Gamble, Danone, and Unilever, Eugene Mota believes in the power of guest posting and the treasure trove that is the comments section when it comes to sourcing leads for an outreach campaign. 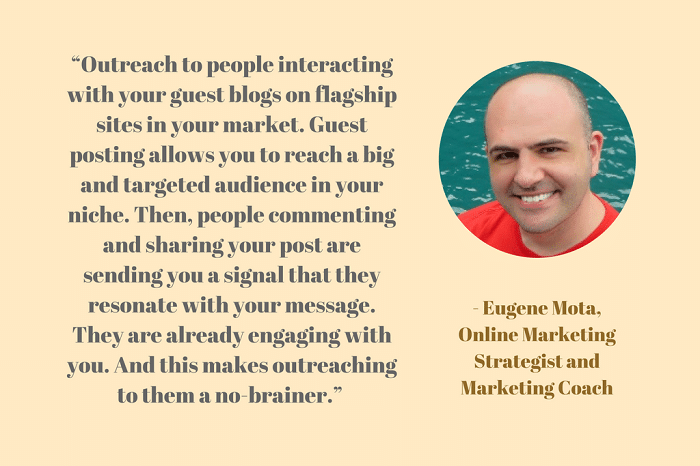 Mota, who now manages his own consulting business as an online marketing strategist and marketing coach for entrepreneurs, explains how guest posting lets you “reach a big and targeted audience in your niche. From this point, Mota says, this makes outreach to them a no brainer, since they are already engaging with you in the first place. 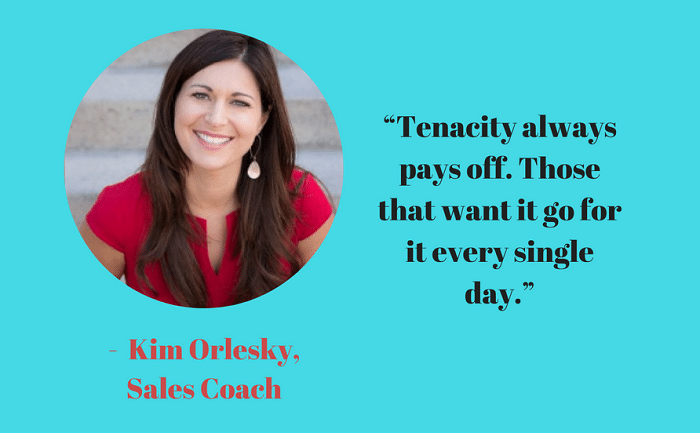 Finally, when it comes to sourcing and following up on outreach prospects, Kim Orlesky, a sales coach who, after a long career in corporate sales now manages her own consulting business, concludes that tenacity is key. 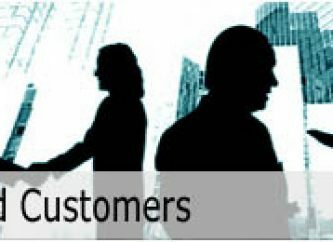 After working as a solutions executive and account manager for the likes of Xerox, Clarion Medical Technologies, American Express, and Canada’s transportation and logistics network Purolator Inc., an influencer like Orlesky would know the backbreaking outreach work that it takes to build a brand and convert prospects into customers. Before the internet and social media, there were few creative ways to promote brand awareness. Executing instant and global outreach was expensive, and left only to big media companies and well-funded advertising firms who rely on traditional media such as television, radio, and print ads, which, naturally, do not cost peanuts. 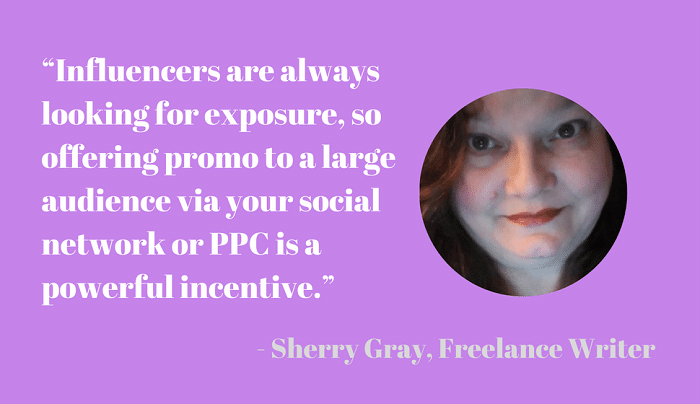 Now, armed with an internet connection, a keyboard, and the discipline to learn and execute a well-planned strategy, almost anyone can reach out to influencers online. We hope that, with this best practices expert roundup, you have added enough useful insights in your repertoire to do so. After all, adding more arrows to your quiver of outreach tactics won’t hurt.